You want to be FREE! You want to SOAR! You want to feel POWERFUL and ENABLED and create art that you LOVE and makes your HEART SING! I truly believe that you are amazingly creative and I want to help YOU actualise your potential! I want to encourage you and your creative heart to do and make what you love! I love “Get Inspired”. This PDF is filled to the brim with helpful ideas on how to reach your fullest creative potential! From looking at the fears that stop you from creating to uncovering ways to by-pass the inner critic. For the easily overwhelmed, Iris lists several easy ways to get started on your art journal pages going over art supplies and creative prompts to get you in an art-making mood! :) An inspiring PDF indeed! I give you insights into my creative journey. We are all learning and we can learn so much from each other. I talk about my fears, my hopes, my successes, my failures, everything! I share uplifting messages, inspiring quotes and my art with you so you will start to feel your true potential and that anything you dream is possible! To get you started pop your details below to start receiving my newsletter and for instant access to your 20 page art & inspiration guide which I’ve specifically created for you to get inspired & create art! There are lots of goodies in there that will get you started on your true creative path in no time. In it you will find practical art tips & photo tutorials, art supply recommendations, insights into why we get blocked and how to get past this, plus inspiring quotes to get you feeling positive and awesome (because you are)! I will also be sending you monthly updates with a selection of the most helpful, inspiring and popular posts from my blog. You’ll be the first to know about any new and exciting things coming to Iris-Impressions.com such as (free) PDFs and videos, e-courses and special discount codes only for subscribers! My dear friend Iris has a new FREE tutorial out. It's all about inspiration, how to draw whimsical girls, whimsical animals, and hand lettering. It's a FREE 20-page art tutorial!! I've just downloaded it and it is absolutely beautiful. Inspiration for the day! <3 Generosity like this is good for the soul! 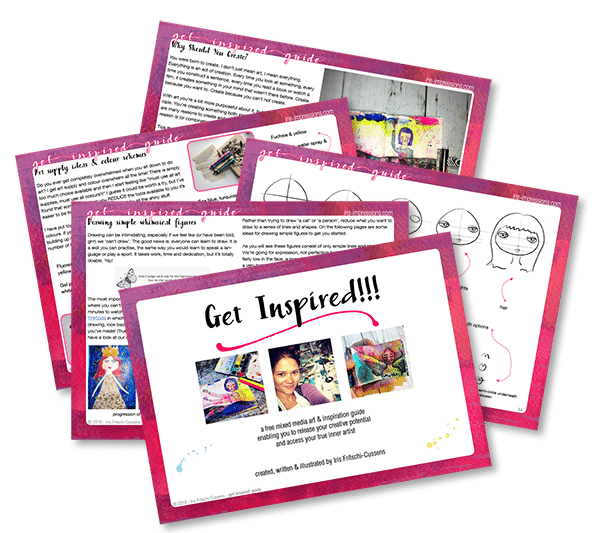 It's a 20-page art tutorial that she has poured her heart into and giving away FREE! If you've been considering trying art as a healing hobby, check it out. Read your guide yesterday and it helped me alot! Thank you so much for creating it! Love your videos and your art, thank you for sharing & caring! Iris does a great job of showing “stuck” artist simple tips to get started. This guide is full of fun and easy to use ideas that will help identify our fears and just get moving. Thank you Iris for sharing your knowledge to help other artist find their creative self! Important Note: If you're anything like me you don't give your email address out just like that, so here is my promise to you to keep it completely safe. I hate spam just as much as you do! Would any of your friends benefit from this guide? Click here to email this link! Or use the icons below to share on social media.